On March 22, 2017, Joseph E. Martineau presented on the First Amendment as part of the Missouri Bar's biannual lecture series, Mini Law School. Mini Law School is a six-week lecture series in which area residents can sign up to learn more about how the law impacts their lives. Joe's presentation delved into how the age of social media, political discontent, and protest has altered the interpretation freedom of speech. He detailed exactly what the First Amendment protects in this new era, prior restraints, the difference between hate speech and free speech, what rights protesters possess, privacy and copyright laws, and much more. Joe focuses his practice on media and communications law as well as intellectual property law, health law litigation, and complex commercial litigation. His clients include local and national major media representatives. 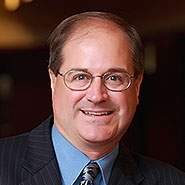 Joe has tried cases in both the state and federal courts in Missouri and Illinois, and he has argued cases in the appellate and Supreme Courts in each state. To view the presentation, click under "Resources" below.